The B.C. Teachers' Federation has pulled controversial postesr from its webpages that called on teachers to take an active stance against recruitment by the Canadian Armed Forces. The B.C. Teachers' Federation (BCTF) has pulled controversial posters from its website that called on teachers to take an active stance against recruitment by the Canadian Armed Forces. The posters were created in 2010 in response to concerns about the federal government's recruiting methods at the time, according to a spokesperson for the teachers' union. 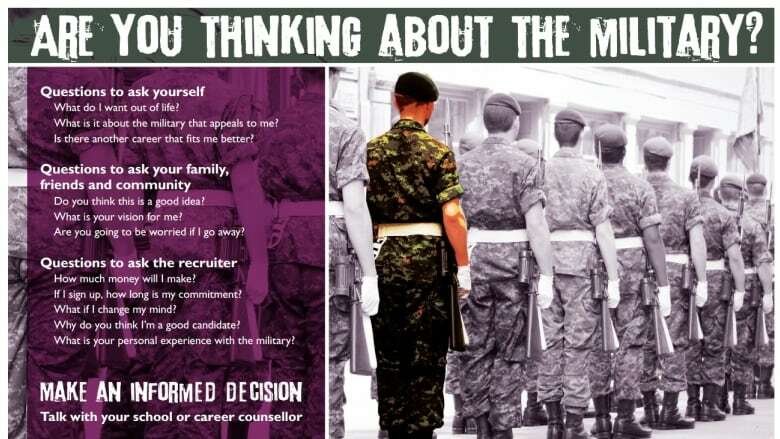 One of the pamphlets calls military recruitment a 'social justice issue' and asks students considering a career in the Canadian Armed Forces to ask themselves if there is another career that would suit them better. The second poster encourages teachers to support "counter-recruitment messages and programs" in schools and to make sure students are aware of statistics about military casualties, liabilities and suicides. "As teachers, which actions could be an effective component of a counter-recruitment campaign in your school or community?" it said. The documents are not currently in circulation but existed on the BCTF website until they were taken down because of a recent online backlash. Last week, links to the posters spread on social media sites, along with criticism from people who support the Canadian Armed Forces and the military community. Zoe Baker, a former teacher and military wife in Comox, B.C. created an online petition against the messaging in the posters. "I feel that it's a misrepresentation of teachers and their attitudes towards the military," Baker said. "I would like them to issue a formal retraction and state that this does not reflect the voice or teachers in B.C." As of Monday, the petition had gained more than 600 signatures from people who identify as current teachers, military veterans and people who support the Canadian Armed Forces. BCTF member Lida Carey, a math teacher in Revelstoke, was outraged by the posters when she saw it on Facebook. "I just think that it is really short sighted by the BCTF to say that we should talk kids out of (a military career) or tell military people that they shouldn't be (in schools), Carey said. "I think the military plays a role. Even if peace were to happen overnight, we still need the military." In a statement, the BCTF wrote the posters were created several years ago in response to teachers' worries about recruitment strategies in schools as well as a nation-wide TV ad campaign from the former Harper government which seemed to glamourize combat and target youth. B.C. teachers appreciate and respect the sacrifices Canadian veterans have made, the union said in the statement. The posters are no longer in circulation and the original documents have been pulled from the BCTF website. However, images of one of the posters are still on BCTF websites. It is displayed in a document that lists classroom resources. 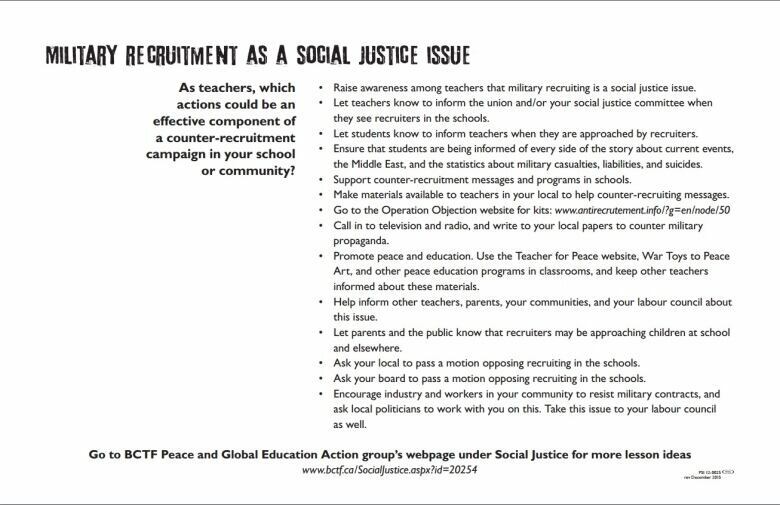 The Vancouver North Island Teachers' Association's website displays a newsletter from November 2016 titled "Seeds of Social Justice" which features one of the posters and suggests how teachers can use it as a resource "to ensure that young people are equipped with the necessary information and tools to make informed decisions around joining the military."